There are scholarships available through the Office of the Dean in the College of Liberal Arts. They are available to any major in the College of Liberal Arts, but there is not an application process. Click here to see those possible scholarship opportunities. This scholarship was established in 2008 to honor Joel Blass, who was a Mississippi State legislator, Mississippi Supreme Court judge, faculty member of the UM School of Law, and supporter of the academic study of religion. The recipient will be a full-time junior student who is majoring in religious studies and who has demonstrated exceptional ability as a scholar and student leader. 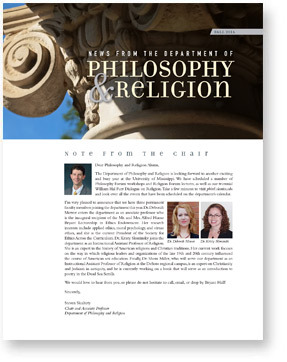 For additional information please contact the Department of Philosophy and Religion. This scholarship was established in 2008 to honor the parents of William Lawhead, a beloved professor of philosophy and former chair of the Department of Philosophy and Religion. The recipient will be a full-time junior student who is majoring in philosophy and who has demonstrated exceptional ability as a scholar and student leader. For additional information please contact the Department of Philosophy and Religion. This scholarship was established in 2014 to honor Verena Erlenbusch, a philosophy professor at the University of Memphis, who donated her speaking honorarium to help students in need. The recipient will be a full-time philosophy major who has the potential to succeed in graduate school and who could bring a new or underrepresented perspective to the discipline of philosophy. For additional information please contact the Department of Philosophy and Religion. This scholarship was established in 2017 with a generous gift from Leigh Anne and Sean Tuohy. This scholarship provides a course-tuition waiver for REL 380 Community-Based Internship and compensates the intern for expenses incurred while serving a local community organization.